If you were (and perhaps still are) a Monster Kid, you can identify with 10-year-old Zoe (Aida Valentine), who loves and lives for horror movies. You might also identify with the fact that parents don't always understand this and might even regard such an avid interest with a fair amount of disdain bordering on hostility. In writer-director Jessica Scalise's ZILLA AND ZOE (2017), Zoe's morbid preoccupations get her into trouble when her attempts to shoot a horror home movie for a local contest results in chaos during the hectic preparations for the wedding of her older sister Zilla (Sam Kamerman). Thus, Zoe's dad Sal (Greg James), who has raised his two daughters alone after the family was abandoned by their mother, forbids further horror pursuits and orders her to record the wedding activities instead. Then Zoe hits upon a bright idea--she'll turn the wedding itself into a horror movie and kill two birds with one stone. It sounds like a springboard for raucous, unrestrained hilarity, which the film struggles to achieve with a plethora of odd characters and borderline farcical situations (such as the entire wedding party getting arrested during bridal gown shopping after Zoe's friend Francis attacks them dressed as a werewolf). The clash between families yields lots of potential comedy as well, with the reserved Sal and his unkempt unemployed brother Oscar clashing with their upper-class future in-laws. These include Zilla's lesbian fiancee Lu (Mia Allen), Lu's pushy, wedding-crazy mother Cora (Julie Elizabeth Knell) and terminally cynical father, and their three eccentric sons, one of whom is a flamboyantly gay transvestite. There's an amusing sequence in which the two families try to pick a church that will accomodate their unconventional nuptials, and some of the dinnertime conversation is fun to listen to. Little of this is sharply funny, though, most of it coming off like an episode of a mild Netflix comedy or something. The film also has its dramedy elements, with the whole messy shebang threatening to come between the betrothed women and Zoe's conflict with her father over all that "horror stuff"--including her dragging around a coffin that she's bought at a magic store and shaving the neighbor's dog to obtain hair for Francis' werewolf makeup--leading to hurt feelings that will have Zoe feeling unloved and Sal plagued with guilt and remorse. 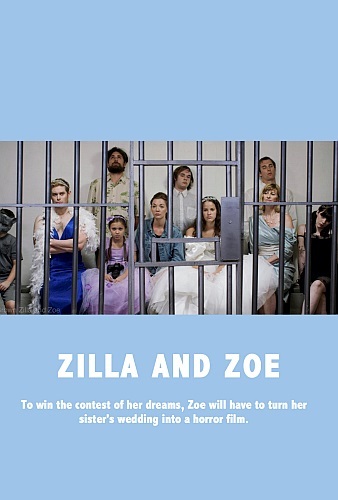 Through it all, ZILLA AND ZOE keeps gamely plugging away at being both a breezy, frothy comedy and a sweetly emotional character play and sorta pulls it off even though neither effort scores an unqualified success. The best part is the ending, which is so brimming with good-natured positivity and fun that I ended up liking the film despite not really enjoying it all that much.